The SNP, like Scotland, has tough choices ahead. Flickr/Scottish Government. Some rights reserved. The SNP is understandably in good spirits. These are the sort of times that politicians dream of. In the aftermath of the indyref, the SNP has gone from strength to strength, winning 56 out of 59 Westminster seats in May, and looking certain to retain and even strengthen their parliamentary majority at Holyrood next year. Despite this the SNP leadership feels it has to negotiate a careful line. First, talk about a second indyref has been effectively banned in public. Even openly reflecting on why last year’s referendum was lost has been officially discouraged. Second, as one insider said, its intended focus is on ‘Holyrood 3, not indyref 2’ – with the aim on an historic SNP third term. That should mean discussing domestic policy and the government’s record. But given the rising criticism of some of that – in educational attainment, health, Police Scotland and local government for example – little seems to be getting put forward beyond general mood music of ‘keeping public services public’, ‘standing up for Scotland’ and opposing ‘Tory austerity’. Something interesting is going on in the SNP. On the one hand there is a bond of trust between its elected politicians and members. This is a party with a shared mission: independence. There is a pride in the SNP government. But there is also a desire for more radicalism in certain areas. This was evident in the debate on the moratorium on fracking, and the vote for more far-reaching land reform that saw the anodyne resolution congratulating the government’s existing bill remitted back. Nowhere though was there an open acknowledgement of the difficult and tough choices the SNP will face with public spending cuts and what this will mean for public services. The only reference to this was the leadership code of talking about the need to dampen down the high expectations of party members and voters. There is a whole terrain the SNP could address. It could start examining the consequences which flow from the Scotland Act 2012 and the current Scotland Bill based on the Smith Commission. These give the Scottish parliament a range of tax powers and more fiscal autonomy. There is a debate to be had here about the balance between stopping Tory welfare cuts and defending public services. Then there are the challenges facing the Scottish economy with unemployment up 18,000 last week, and the national rate of 6.1% now significantly ahead of the UK rate of 5.4%. Low pay and poverty are too prevalent and we need to move beyond the mantra of the living wage as the solution to everything. Additionally, change is desperately needed in local government finance, with no property revaluation since 1991, and the commission on local tax reform parked without agreement. The terms of debate have to change. The SNP has to loosen up a bit, embrace detail and not be so defensive about constructive criticism. There is an absence of mature critique and scrutiny. This isn’t aided by the noise of immature criticism from people trying desperately to knock the Nats off their perch. This week The Spectator had as its front cover: "Big Sister: Inside Nicola Sturgeon’s One-Party State". The Economist declared that the SNP were "more akin to Argentina’s Peronists than the Scandinavian Social Democrats." The next twelve months will be shaped by Nicola Sturgeon wanting and aiming to win her own mandate. That will be a significant moment. It will coincide with the SNP undertaking a transition – becoming what looks like Scotland’s natural party of government. That is the price of success, but it comes with responsibility and a cost. It isn’t convincing to continually blame others whether Tories or Westminster, even when it might be right. It isn’t possible to win radical credentials by berating Trident or Tony Blair’s illegal Iraq war, when public spending cuts are biting so severely. The SNP have now been in office for eight years and have governed Scotland for longer than the Labour-Liberal Democrat administration which preceded it. 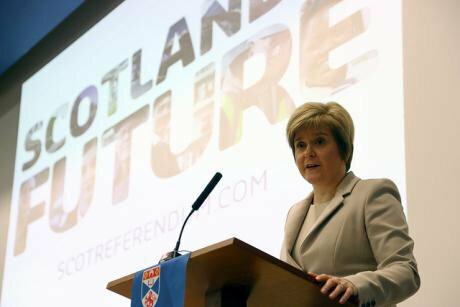 Nicola Sturgeon has shown a different kind of politics and leadership from her predecessor. She has shown adeptness on the question of a second indyref – knowing she has to keep activists happy while reassuring voters. In her keynote speech to the SNP conference on Saturday, Sturgeon laid into Corbyn’s Labour for incompetence and its significant amount of policy U-turns from the fiscal charter to ambiguity on Trident, as well as the Conservatives for their callous dogma and lack of popular support in Scotland. She also chose to make the case for a personal mandate in 2016 inviting voters to ‘trust her’ to maintain public services, their funding (as much as is possible) and to resist Tory austerity. This is a powerful appeal when Sturgeon, in her near-twelve months as First Minister, has had an extended honeymoon period. But it will have risks as the cuts start to hurt, and her government’s room for manoeuvre is restricted. Not all of this will be seen as the fault of Westminster and the Tories, and some discontent will blow back onto the Scottish government and the SNP. This then has to be a time for a politics of candour and honesty, of admitting not everything is rosy in the garden of SNP Scotland, and using this to open up a debate about the difficult choices we as a nation are going to have to face. What strategic choices do we as a nation want to agree to in such tough times? Let’s have that open conversation. This is about something rather big: namely whether the SNP are really the party of Sturgeon's social democracy, or of John Swinney's safety first fiscal conservatism. The SNP cannot continually undertake a balancing act, which allows them to be all things to all people, while their social democratic ambition is limited to protecting previous public policy choices. Above all, the SNP cannot afford now to become the party of status quo Scotland – a fate that befell the Labour Party in Scotland during its dominance, and to its fatal cost.